The BlueAnt Pump shares some of its design elements with other sport headphones but unlike its competitors, the Pump is actually worth using even if you are not exercising. Sport headphones have a tendency to be very lackluster in their audio quality, and while BlueAnt’s are not spectacular, they are definitely better than some. It can be a little bit tricky to actually get the Pump headphones on, since positioning them involves bringing them from behind your head and then sliding them down your ears. However, once you actually get the headphones on, they are comfortable and do not necessarily stand out too much. As with any sport headphones, the ability for them to stay on during exercise is one of the most important things to consider. Luckily, not once during testing did I encounter any issues with the Pumps staying on my head, which made working out significantly easier. If you happen to be a swimmer, then you may also be able to use the Pumps. Although BlueAnt says that they will not be able to work wirelessly when under water, if you do not frequently go underneath the surface, you should be able to use these without any problem. Of course, being waterproof has benefits outside of swimming, since you can use these when sweating or when in the rain and not have to worry about ruining them. One of the best things about the Pumps is their range. According to BlueAnt, they are able to reach up to 100 feet and in my testing, that was definitely true. 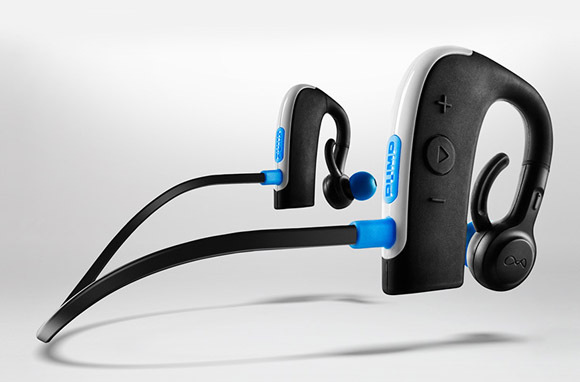 Unlike other Bluetooth headphones which sometimes cut out or simply do not reach very far, the Pumps worked from very far away without any issues in terms of actual audio quality or consistency. When exercising it is incredibly nice to not have to worry about the headphones suddenly not picking up audio anymore, which is a very positive aspect of the Pump. Overall, the sound quality with the BlueAnt Pump was fine. While not amazing, there was nothing absolutely horrendous about the way music sounded. The one downside that is present, however, is that the bass is emphasized a bit too much. Some people absolutely love using headphones likes Beats which focus on bass but for those of you who do not know, it is important to note that the BlueAnt Pump are a little bit bass heavy. Outside of the bass issues, the sound quality is comparable to wired headphones in the $50-60 range, which is impressive considering that these come with many non-audio related features. The BlueAnt Pump headphones are easily the best that I have used when exercising and despite some bass issues, the audio quality present with these headphones was fine. As long as you do not mind a slight emphasis on bass, then these headphones are great if you need ones that can be used when exercising and when you do not want to deal with wires.